Hey Coffeeholics! 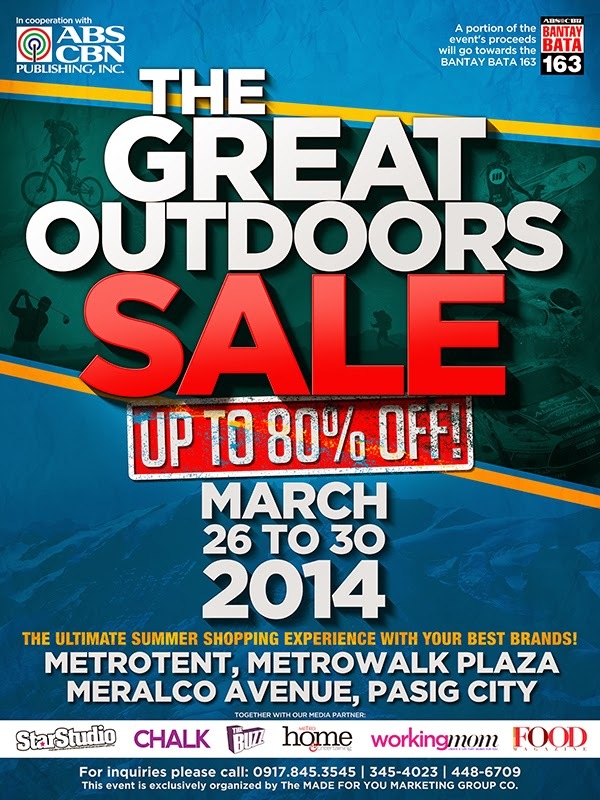 The Great Outdoors Sale is happening this March 26-30, 2014, at the MetroTent Convention Center. This event is a summer sale event of your favorite big brands as well as travel, sports, and hobby equipment that is perfect to start your summer. This sale was made possible by The Made for You Marketing Group, together with their media partners, ABS CBN Publishing, ABS CBN Licensing, ABS CBN Mobile, and Star Records. Their beneficiary for this event will be Bantay Bata 163. So don't forget to MARK YOUR CALENDARS for this huge sale coming to you this March!